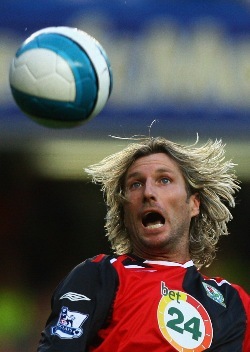 Why is Robbie Savage so scared of this football? There was a lot to frighten a football fan at Stamford Bridge this weekend. Flying boots leaving players hospitalised? Check! Ranting Portugueser? Check! Shocking linesman? Check! Shevchenko playing like a Rushden & Diamonds part timer? Check check check! he wasn’t spooked – he was simply preparing himself to swallow the ball in that very big mouth of his. He’s petrified it might ruin his coiffeured hair. CAshley Cole on knees (out of picture). Dirty. John Toshack’s arse is printed on the other side of the ball. He’s scared because he can’t foul it.